The Friends have again packed a great deal into the past year. We opened the chapel on the public-holiday Mondays, for the National Heritage weekend, and on Wednesday afternoons in August. As always I am very grateful to the stalwarts among the Friends who staff these occasions. We have hosted a number of group visits. These are made by secular bodies such as U3A groups interested in the history of the building and its architecture or by church groups including one from St Margaret’s, Ilkley, one from Gildersome Mothers’ Union, and one from the Men’s Group at St James’ Thornes. As in previous years, we marked the Festival of British Archaeology in August, when Brian Holding gave a presentation on gargoyles, showing the film he has made of these decorative water-spouts on churches across the former Wakefield Diocese. The Friends have organised a wide range of events, I think the right adjective is ‘eclectic’. Among these were a recital in May by Andrew (and Ann) Clark, organised by Diana Grudgings, demonstrating the versatility of the Roland Digital Piano; a show of quite amazing fashions in July which brought an unusual (for the Chantry) crowd of young people; and an exhibition over two days in October of models created at Wakefield Day Centre of significant Wakefield buildings; Kate Taylor gave short talks about the buildings portrayed. 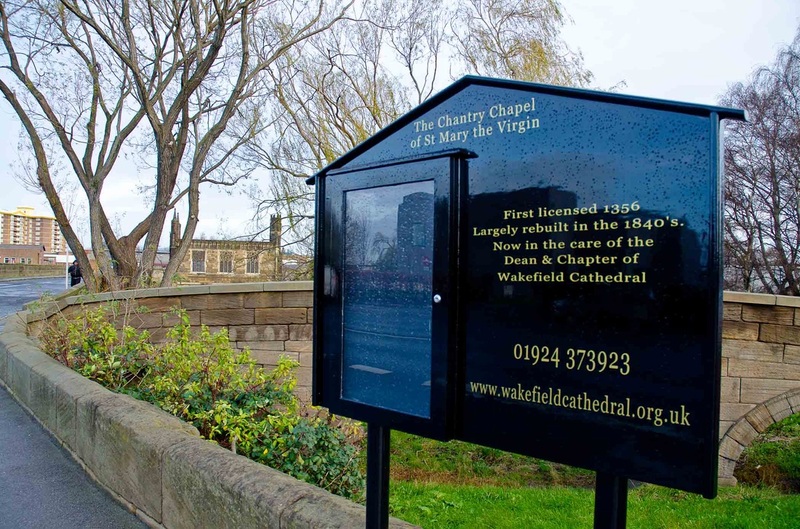 At the end of March 2015, many people who are connected by the Wakefield Historical Appreciation Site met in the Chantry for an evening looking at and discussing images reflecting the history of the town. I spoke after our annual meeting in June 2014 about Wakefield in the First World War. We had hoped to have a speaker from the Chantry in Rotherham but repeated contacts failed to find one. The annual Party on the Bridge in August was modestly successful but we were disappointed that so few children attended especially as the Pop-up Cathedral came with activities and treats for them. The working group determined to hold the 2015 Party on the Bridge in July in the hope of a better patronage. The Chantry has also been open on each of the occasions of the bi-monthly Wakefield Art Walk and we are grateful to Brian Holding for organising this. However the events in the colder months of the year were poorly attended with considerable disappointment for the artists themselves. As a consequence, it was decided to focus in 2015 on only the three mid-year evenings. There were major repairs to the outside of the chapel during the summer. The Friends have funded these with a consequent serious reduction in our capital. At least we have ensured that all the recommendations from the Quinquennial Report have been met and have the satisfaction of seeing the building in good order. Whilst the workmen were with us, the mechanism of the composting lavatory was damaged and it took some time to secure a replacement part. We were grateful to the Cathedral head verger for pursing this. We were also very grateful to Christian Hazell of Tubs and Taps for making his staff lavatory available even, on the important occasion of the Christmas concert by pupils from Wakefield Girls’ High School, for remaining open well beyond the store’s closing time. We had three, very well attended, events at Christmas. Their concert was the first time that girls from the High School had performed in the chapel. Additionally we had a programme of Christmas music from St Austin’s Choir, and the now-traditional Requiem for Richard Duke of York on 30 December celebrated by Mgr David Smith and with members of the Latin Mass Society of Leeds. We have seen some strengthening of our relationship with the Hepworth Wakefield. This was most evident in March 2015 when John Goodchild gave two Thursday afternoon talks in the Chantry on the Gotts, Leeds industrialists who amassed a substantial collection of images of Yorkshire which is now in the care of the gallery. A third afternoon was spent at the gallery itself exploring the Gott collection. We have again received donations to our funds from the Charles Brotherton Trust (£250) and the Lord St Oswald Trust (£500) and remain very grateful for this annual support. As a body, we make good use of the opportunities of the internet and social media to advertise our existence and our events. We have a facebook page, Richard Atkinson tweets on our twitter address (@chantrychapel) and Brian Holding maintains our richly detailed web site. This went live in September 2011. Since then it has had 18,410 page views from1,013 places across the world. The site brings a number of contacts asking for individual or group visits. We need more volunteers if we are to remain able to respond positively to these. We have been saddened by the deaths of two of our long-time members: Margaret Knott, formerly the headmistress of Wakefield Girls’ High School, who often wrote to us after receiving her Newsletter, and Dr Peter Slater who was until very recently an active member of our Committee. He is commemorated by a plaque in the crypt. For further information please contact or Brian Holding brian@bholding.f9.co.uk. This has been another very satisfactory year. We held open days on the public holidays in April, May and August and opened on Wednesday afternoons in June. Our Party on the Bridge on 3 August was a great success with an abundant cake stall, the now popular game of Pooh Sticks, and Victorian games on the bridge organised by the Cathedral Heritage Officer, Tracey Yates. Wakefield Djembe Circle entertained with their drumming and encouraged visitors to join them. We were also open for the National Heritage Days in September. These activities are possible only through the loyal support of the Friends who staff them. The Cathedral Education Department, under the organisation of Ali Bullivent, has again drawn a range of school groups to the Chapel and has provided a number of holiday workshops. We held two events in July to mark the Festival of British Archaeology. On 17 July we had a talk on the role of toll-keepers and on 22 July Kate Taylor provided a guided walk looking at bridges in the vicinity of the Chantry from the medieval to the 21 century. The Friends arranged a number of other very successful events. In April we had a lecture recital celebrating 150 years of Hymns Ancient and Modern, with the St John’s Singers from Hoylandswaine and speaker Elizabeth Charlesworth. On 29 November St Austin’s Choir provided a concert of music ‘from Ancient to Modern’. The Latin Mass Society of Leeds provided the music for a Requiem Mass for Richard Plantagenet, Duke of York, on 30 December. Our final event was an evening marking Earth Hour on 29 March. The Chantry has also been open on each of the occasions of the Wakefield Art Walk and we are grateful to Brian Holding for organising this. The speaker at our annual meeting in June was Michael Bradley, Administrative Deacon at Wakefield Baptist Church, who told us of the work that is done at the Baptist Centre at Belle Isle with the homeless. He emphasised the need for winter scarves, socks and gloves for those sleeping rough. Accordingly we appealed for these for the Harvest Festival Service in October and were able donate a clutch of warm items to the Church. We opened the Chantry for an overnight Vigil for the Homeless on 25 October when members of Wakefield Baptist Chapel organised a fund-raising sleep-out on the bridge. The Baptist team provided hot drinks and cakes. A notable achievement has been the provision of a splendidly robust noticeboard with a window-panel in which we can place posters. This has been made in the workshops at Wakefield Prison and erected at a site approved by English Heritage at the Doncaster Road end of the bridge by Wakefield MDC Highways Department. It has been financed by the Wakefield Neighbourhood Improvement Fund. It was blessed by the Bishop of Wakefield, the Right Reverend Stephen Platten, in December. We are grateful for the support and advice of Jane Brown (Wakefield MDC Highways), Councillor Olivia Rowley, and Wakefield City Centre Manager, Andrew Woodhead in seeing the scheme to fruition. Brian Holding has maintained our website From the point when it was set up in 2011we have had 12,114 page views from 549 cities across the world . We now get between 30 and 50 visits a week. Richard Atkinson tweets for us @chantrychapel. Our finances are in good shape but we are still very well short of our target capital of £100,000. Members have been very generous in making additional donations to our funds. We received £250 from the Charles Brotherton Trust and £500 from the Rowland St Oswald Charitable Trust. In February, your chair went to a symposium in London on Bridge Chapels, organised by the Ecclesiological Society. This brought us a donation of £100 from the Rochester Bridge Trust. We submitted the final report to the Heritage Lottery Fund about our project to reorder the Chantry and received the outstanding £5,000. The anticipated repairs to the exterior of the Chantry were not, in the end, undertaken in 2013-4 but by the time of the 2014 annual meeting they will be in hand, carried out by Castle Masonry of Conisbrough under the supervision of our architect, John Bailey. After the meeting, Kate Taylor will share some new research with you. The past year has been a very satisfactory one. We held open days on the public holidays in April, May and August, and opened on Wednesday afternoons throughout June, July and August. Our Party on the Bridge in July was a very happy occasion with an innovative game of Pooh Sticks which was enjoyed by young and old, including the Mayor of Wakefield and her consort. We were also open for the National Heritage Weekend in September. Thanks are due to all the Friends who contributed to the staffing of the Chantry and to the activities of the Party on the Bridge. The Cathedral Education Department, under the organisation of Ali Bullivent, has brought many young people to the Chapel, in school groups, or groups from such organisations as the Guides and Brownies, and for a range of holiday workshops. Particularly rewarding were the mosaic workshops in May last year which resulted in some lovely mosaic pictures exhibited in the Cathedral. We were able to satisfy the Esmee Fairbairn Foundation that their grant was being well used and received the final sum of £6,000 in March. We took part in the Festival of British Archaeology in July with a workshop on the images in the stained-glass windows led by your chairman and an exhibition on the history of foundry of Alfred Ellis created by Brian Holding. This attracted a good number of visitors including the Lord Mayor of London, his wife and his swordbearer, accompanied by the Lord Bishop of Wakefield and the Dean. Your chair gave six talks on Aspects of the Diocese of Wakefield, three in April and three in October. She has also given a number of talks at other venues, taking a donation on each occasion for the Friends’ funds. The most impressive of these was a £250 donation from Wakefield Rotarians at their annual dinner. Fund raising events included a concert of Music for an Autumn Evening, organised by Diana Grudgings, on 29 September, and the traditional Christmas programme by the Accord Singers on 18 December. Wakefield Diocesan Drama Group gave a performance of Survivor on 2 February which was followed by a discussion. Funds come in, too, from the collecting boxes which a number of local firms place on their counters|: Kingfishers Chemists, Rusby’s Farm Shop, The Toolbox Company, Tubs and Taps, and Viz Biz. We are grateful for their support and to Diana Grudgings and Brian Holding for gathering in the moneys. We have continued to take part in the Wakefield Art Walk which is organised for us by Gallery Arts, led by Brian Holding. There have been a number of visits from groups from across the country, normally coming as a coach party and on several occasions making a visit to the Hepworth Wakefield at the same time. They have included a group of Soroptomists from Beverley, members of Altofts Women’s Fellowship, Huddersfield Archaeological Society, Liverpool Victorian Society, the East Yorkshire National Trust, the Durham National Trust, and the Pennine Antique Collectors Society. Wakefield Historical Society held its winter meetings in the Chapel from September 2012 to April 2013. The Latin Mass Society of Leeds celebrated a mass on 15 August for the Assumption of the Blessed Virgin Mary on 15 August and a requiem mass for Richard Duke of York on the anniversary of his death at the Battle of Walefield on 30 December. Wakefield Soroptomists took over the Chantry and the Bridge to host a large gathering on 9 March 2013. We again held a coffee morning for Macmillan in September but there were rather a number of similar events in the locality on the same day and we raised only £40 in all. Members of the Friends have continued to be very generous in making donations to our maintenance fund as well as paying subscriptions. We still remain well short of our target of a capital of £100,000 however, and we shall face a substantial bill this summer for the repairs identified at the Quinquennial inspection. We have again received generous grants from the Charles Brotherton Trust and the Rowland St Oswald 1984 Charitable Trust. We are most grateful to our new treasurer, Richard Atkinson, for his commitment and skilled work for the Trust. We were saddened that Mrs Pat Langham felt unable to continue as a member of our Management Committee and we are very sorry indeed to lose Jack Smith as our vice-chairman. Jack has been a tremendously loyal member of the Friends for very many years and has given an immense amount of time to our work. He has also produced many lovely greetings cards to raise fund for the Friends, making use of his photographs of the features in our windows, and of the statue of Mary. Figures from Brian Holding show that in the 20-month period from October 2011, over 1,997 people have visited the Friends’ website, with a total of 6,323 page views. They have come from 43 different countries and 353 different cities world wide. Our long-standing treasurer, Harry Livesey, died on 15 April. He had looked after our money since 2001, coping with all the additional financial transactions we had in 2007 when lead thieves damaged the roof and parapet, and the substantial work involved in 2009-10 during the reordering scheme. It was a position to which he was utterly dedicated and he has left our records in excellent order, maintained almost until the day of his death. Whilst the proposals submitted to the Heritage Lottery Fund in 2009 for the reordering scheme, included the provision of workshops and visits from school groups, the whole of the income for the project was taken up by the reordering. However we were awarded £20,000 at the end of the last financial year from the Esmee Fairbairn foundation, with an initial sum of £14,000 coming in on 3 April 2011. This is being carefully laid out via the Education Department at the Cathedral and there have already been many successful workshops and school visits masterminded by the hugely creative Ali Bullivent. During 2011-12 we returned to our practice of holding open days on public-holiday Mondays. And we opened again for the National Heritage weekend in September. Additonally, as a consequence of the opening of the Hepworth Wakefield, we opened for two hours every Wednesday afternoon in June, July and August 2011. Craft workshops were an additional attraction on all the August open afternoons. Visitor numbers were good – as many as 65 in the two hour period on some days – but the income from donations was disappointing. Nevertheless we shall hold similar open afternoons this summer. For our Annual Meeting in June 2011 we were able to return to the Chantry and much enjoyed the slide presentation by Malcolm Warburton on his recent visit to India under the title Delhi, Agra & Rajasthan - a journey in search of the Moghuls’. Brian Holding and Gallery Arts marked the opening of the Hepworth Wakefield in May 2011 by holding a week-long exhibition of work by local artists in the Chantry at the same time. It was immensely successful attracting some 1500 visitors. Our programme of Adult Education has included a talk in June 2011 on Green Men and Gargoyles, further talks in October 2011 on Aspects of the Diocese of Wakefield, and a talk on November on Sacred Landscapes. Brian Holding took up the gargoyle theme himself and photographed many of these water-spouts at churches across the diocese, providing a presentation of the images at our open day on 29 August. He and his wife, Shirley, provided a gargoyle-making workshop on the same day. Members of the Roman Catholic church held a mass on 15 August for the Feast of the Assumption of the Blessed Virgin Mary to which Friends were invited. As a new venture we held a Macmillan Coffee Morning in September, giving all the proceeds directly to Macmillan Cancer Support. The year saw an increased number of visits by groups, including a number of coach parties visiting both the Hepworth Wakefield and ourselves. Among them have been branches of the National Trust, and Fine Arts Societies. Wakefield Soroptomists hosted a morning for other members of the Society from across Yorkshire in January 2012. We have enjoyed some additional income this year from the work of Diana Grudgings in selling advertising space on sheets which now go out with our Newsletters. We have also received a modest income from the collecting boxes placed with local business concerns and we are grateful to them for supporting the Chantry in this way. Whilst arrangements for acts of worship lie outside the role of the Friends, it is worth noticing that Diana has also prompted the addition of services on third Sunday of each month. However we marked the Harvest Festival on 2 October by organising a collection of fresh and long-life foodstuffs all of which were taken to the Baptist Chapel at Belle Isle for their work with the homeless. Students of Architecture from both Nottingham and Sheffield Universities have visited the Chantry on a number of occasions: the former were engaged in a project to design a new building on a bridge; the latter were studying a range of buildings in Wakefield to draw up conservation plans. It is always a source of great pride to us that visitors admire the Chapel and that it is so well maintained. Thanks are due to the Cathedral vergers for their regular and careful work in maintaining the cleanliness of the interior and coping with the composting lavatory! We issued two new picture postcards during the year – one of the newly re-ordered interior of the chapel and the other of Linda Golding’s delightfully quirky representation of the Chantry and the Hepworth Wakefield. The latter has proved especially popular. For the third year, we were beneficiaries of the Charles Brotherton Trust. We have also received another welcome grant from the St Oswald Trust. Members of the Friends have continued to provide valuable help in staffing open days. Among those who have assisted on many occasions, I should like to thank Eileen Calkeld, Betty and David Charlesworth, Joyce Graham, Brian and Shirley Holding, Donald Issatt, Ann Kendall, Sandra Palmer, Wendy Robb, and Jack and Marta Smith.